Your knees are some of the most active and most important joints in your body. No matter what you do, your knees are almost constantly in motion. Those of us who have suffered knee injury know how awkward life becomes when you can’t move your knees properly. Since knees carry the load of the body, particular care should be taken to keep them healthy and functional. Even minor knee problems can greatly reduce your quality of life. Therefore, if your occupation or leisure activities require you to put your knees in danger of impact or prolonged contact with hard surfaces, knee pads are a guaranteed way to keep your knees out of harm’s way. You’ll be needing your knees for years to come. In order to help you keep your knees safe, we have prepared a list of the 10 best knee pads currently on the market, and a guide for buying knee pads that are tailored to your particular needs. 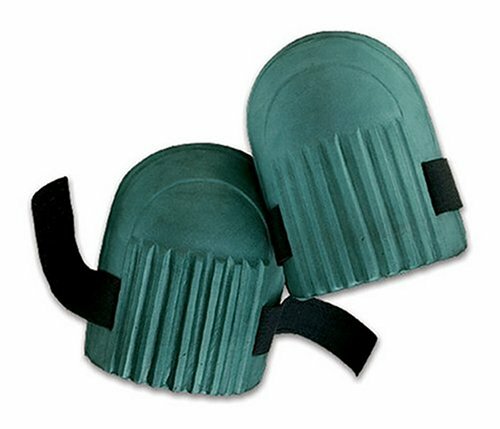 These heavy-duty knee pads are made of strong and flexible plastic, which makes them practically indestructible. These knee pads are sturdy, lightweight and comfortable. They will protect your knees in any environment while making you forget that you are wearing them. Non-Marking Grip Strips – Grip strips on the front of the shells, where your knees contact the floor, will grip to almost any surface. However, they will not leave marks on your floor. Shell – The plastic outer shell is incredibly strong and chemically resistant. It can withstand the stresses of any job site environment. Padding – 5/8” closed cell foam pads will offer the greatest protection and comfort for your knees. Speed Clip – The comfortable elastic woven straps will not get contaminated by dirt and lose their grip like Velcro. The pads can be easily put on, removed or adjusted while you are wearing them. Jointed – The KneePro UltraFlex III pads are hinged with metal rivets, allowing them to move as your knees move. Regardless whether you’re running, jumping, or simply kneeling, they will stay in place and will not fall to the side or bend out of shape. This makes them the perfect choice for activities such as airsoft or paintball. Sizes – Adjustable elastic straps will fit most sizes. The fabled DeWalt DG5204 knee pads are the perfect choice for a multi-surface knee pad. 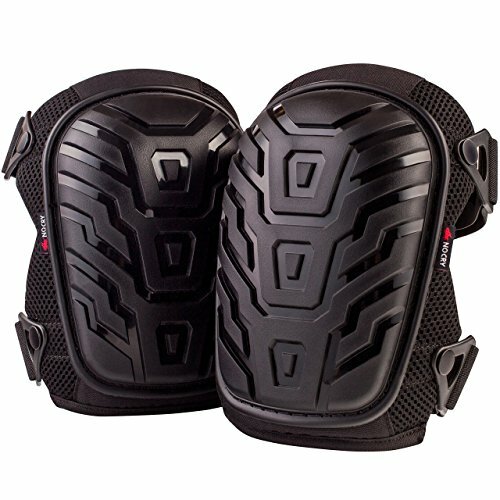 Made from a ballistic poly material, these knee pads are sturdy and durable, while their combined gel and closed foam inner padding makes them comfortable in any situation. Especially recommended for individuals with knee problems and those on the heavy side. Caps – The DeWalt DG5204 has non-skid, heavy duty caps, which are suitable for any surface. Lining – The pads are made from the ballistic poly material that is extremely durable and provides long lasting strength and protection. Padding – Gel padding layered over closed cell foam padding provides exceptional support and comfort. Extra padding around the knee area ensures comfort regardless of your position. Straps – The large neoprene lower strap is durable and stretchable. The upper strap allows you to easily reposition the pads if needed. Heavy-Duty Stitching – All seems of the pads have extra stitching for added durability. Sizes – The neoprene straps will fit most sizes. Fiskars Ultra Light Knee Pads, as their name implies, are extremely light weight. Their tough moisture-proof outer shell makes them the perfect choice for gardening and cleaning the house. Once you’ve put them on, you’ll never remember you’re wearing them. Shell – The rubber outer shell of the knee pads is moisture-proof, making these the perfect pads for work in the garden. It will protect your knees from moisture, cold and rough surfaces. They will not leave marks on your floor if you use them to clean the house. Padding – The soft foam inside the pads provides plenty of cushion for your knees. Ultra Light – Fiskars Ultra Light Knee Pads weigh only 4.8 ounces. Without looking at your knees, you’ll never know you’re wearing them. Sizes – Elastic Velcro straps will fit most sizes. Product Alert: This product is intended to be close fitting for the best support and protection. Although, If the customers measurements are close to the maximum size range, we recommend they select the next size up for comfort. These leg sleeves are versatile enough to be used for both sport and work protection. They are made from comfortable, highly elastic fabric that wicks away moisture, keeping the skin cool and dry. They are perfect for work that requires a lot of movement and short amounts of time spent on the knees. Fabric – McDavid 6446 leg sleeves employ hDc™ Moisture Management Technology. The fabric of the knee pads is designed to wick away moisture from the skin and distribute it over a large area. This keeps the skin dry while making the moisture evaporate more quickly. Padding – 9 mm Hex™ Technology features hexagonally shaped, closed cell foam padding that is bonded to the fabric. That ensures the highest mobility and comfort. Extended Lenght – The knee sleeves reach well above and below the knee, providing a better fit and ensuring that the sleeves will stay in place at all times. Compression Support – McDavid 6446 leg sleeves provide compression support to the knees, reducing the pressure to the joints. Since they prevent injuries that result from great pressure on the knees, the sleeves are ideal for sports such as basketball, weightlifting or running. Sizes – The sleeves come in sizes: Small (10-12″), Medium (12-14″), Large (14-16″), XL (16-19″), 2XL (19-22″). The knee should be measured around the largest part of the knee, directly over the knee cap, while the leg is bent at 45 degrees. AltaFLEX NOMAR knee pads are an excellent choice for construction environments. Their strong and flexible rubber caps provide ample protection for the knees and will grip to most surfaces. Sturdy buckle fasteners will keep the pads in place during long work hours. 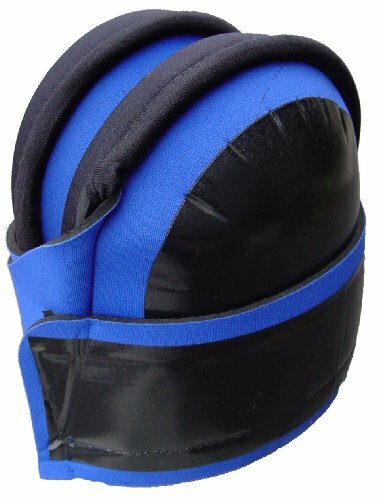 Cap – The rubber caps of the knee pads are strong and flexible. They will protect your knees from injury and will provide good traction on most surfaces. They are connected to the lining with metal rivets which will not give way even under strong pressure. Lining – The AltaFLEX NOMAR knee pads are made from strong and durable DuPont Cordura® Nylon. This material has a long history of military application and can withstand heavy abuse. Padding – The foam padding is comfortable and designed to wick away moisture and keep out dirt and debris. These pads will cause no sweating or overheating to your knees. Straps – Original AltaLOK™ Easy On/Off Fastening System allows the pads to easily be put on or off and adjusted. 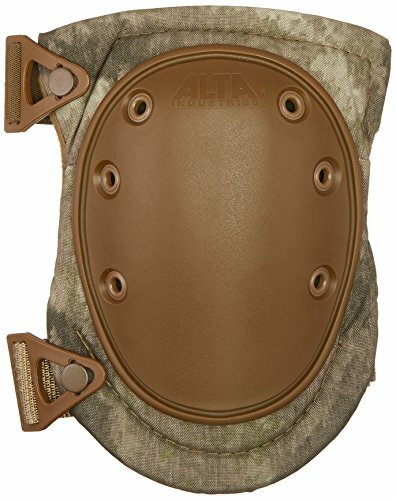 Unique Alta Strapkeeper System allows the excess straps to be secured and not flap around. Sizes – Adjustable straps will fit most sizes. Troxell USA – Original Super Soft knee pads are lightweight and comfortable. Their machine washable neoprene fabric and thick wraparound Velcro fastening straps will not pinch or cause skin irritation when worn on bare legs. They are an excellent choice for gardening and housework. Fabric – Troxell USA Original Super Soft knee pads are made from sturdy and durable neoprene fabric, which can withstand any weather and is completely machine washable. Padding – Thick closed cell foam cushions provide comfort on most surfaces. Perfect for house cleaning, gardening and work on relatively flat surfaces such as concrete. Front Fastening Velcro Strap – Extra wide Velcro strap sits below the knee and fastens at the front. It will not pinch or cause rashes, so the pads can be worn on bare legs. Lightweight – The pads are lightweight and comfortable, making you forget you’re wearing them. Sizes – They come in sizes: Small, Regular/Medium and Large. 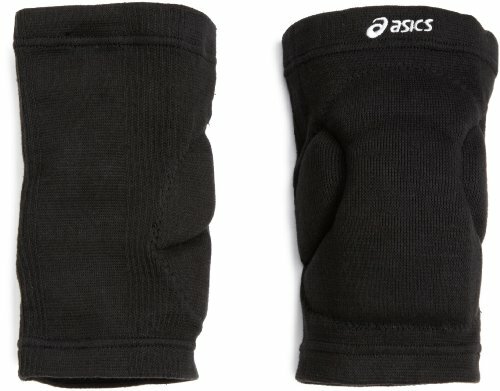 ASICS Unisex Slider V. Knee Pads are highly versatile and can be used for both work and sport. The soft, stretchable fabric allows the knee pads to be worn both over or on under the pants and is machine washable. While they lack the hard outer shell, their thick Polyurethane pads provide ample cushion for kneeling on any surface. This particular feature makes them the ideal choice for any work environment that requires mobility. Fabric – The ASICS Unisex Slider V. Knee Pads are made of a stretchable polyester, nylon and rubber fabric. The fabric is easy on any skin and is machine washable. Padding – Wide coverage Polyurethane foam pads are sewn into the fabric. The foam pads are extra wide, covering the entire kneecap and the area around it. This ensures that the pads will protect your knees from impact in any situation. Extended length – Although not as long as the McDavid 6446 pads, these pads also reach well above and below the knee for added comfort and protection. The Custom Leathercraft 302 Shock Absorption kneeling pad serves the same purpose as knee pads, keeping your knees dry and comfortable on rough surfaces. It is the perfect tool for quick tasks when you don’t want to bother with putting on knee pads, or for tasks where mobility is paramount. Material – The Custom Leathercraft Kneeling Pad is made from NBR (Nitrile Butadiene Rubber) foam. This material is highly resistant to oils, fuels and other chemicals, as well as extremely low and high temperatures. 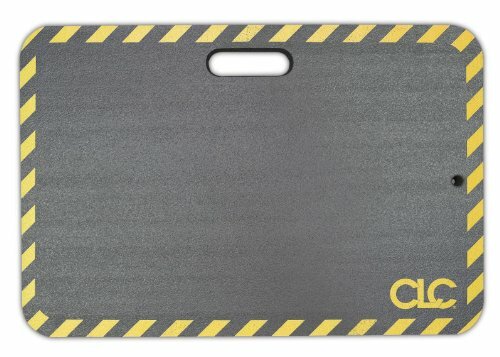 This makes the pad perfect for work in the garage or other environments where oil or chemical spill is a possibility. Comfort – 1-inch thick NBR foam provides excellent cushioning and shock absorption, keeping your knees comfortable on any surface. Diagonally Striped Perimeter Lines – Diagonal lines around the edges of the mat increase its visibility and reduce the hazard of tripping. Sizes – The pad comes in sizes: ( 301) Small: (8″ x 18″), (302) Medium: (14″ x 21″), (303) Large: (16″ x 28″) and (305) Extra Large: (18″ x 36″). Mizuno LR6 is another highly versatile Volleyball Kneepad on our list. Its VS-1 padding technology ensures ample cushioning and protection for your knees while providing maximum freedom of movement. Perfect for sport or jobs where mobility needed. 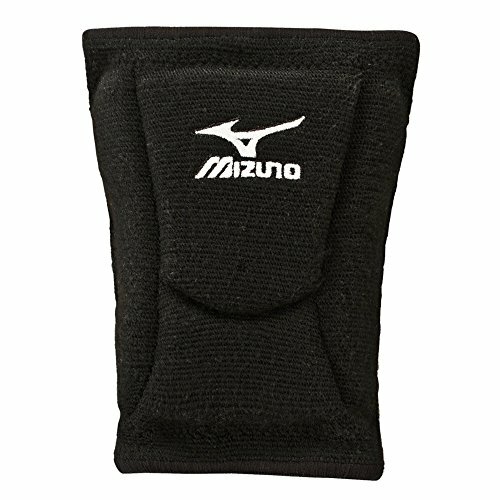 Fabric – Mizuno LR6 Knee Pads are made from a mixture of polyester, rayon and spandex. The fabric is comfortable, but stretchy enough to keep the pad in place during sport or work activities. It is machine washable. Padding – The knee pads include strategically placed VS-1 padding that is sewn into the fabric. The padding covers the entire kneecap and its surrounding area, protecting the knee from frontal or side impact. DFcut (Dynamic Function Cut) technology ensures that the pad will stay in place while providing an unrestricted range of motion. Mizuno Intercool® technology – The fabric of the pads uses a lightweight micro yarn knit, ensuring superior moisture management and evaporation. It is designed to enhance air flow, keeping the skin cool and dry. Sizes – Small (under 13.5″), Medium (13.5″-15.5″) Large (over 15.5″). The Measurements should be taken 1” above the knee. No Cry Professional Knee Pads are some of the most comfortable knee pads currently on the market. Their padding is made of EVA foam with an added extra thick gel cushion, making your knees fell as they’re surrounded by pillows. These pads are perfect for any job that requires long hours spent on the knees. Cap – The non-skid PVC caps of the NoCry Professional Knee Pads will grip most surfaces and will not leave any signs on the floor. They are textured and flat at the center to prevent rolling or slipping and ensure stability on any surface. Lining – The inside of the pads is made mainly of heavy-duty 600D polyester fabric, which provides maximum durability. Padding – The pads are made from EVA (Ethylene-Vinyl Acetate) closed cell foam with an extra thick gel cushion. This makes the pads exceptionally comfortable, allowing the user to kneel for hours on end without difficulty. Straps – The pads are held in place by flexible neoprene straps, which are connected by slip buckle clips. The clips allow for easy on/off, while the breathable neoprene straps prevent heat buildup. Sizes – The stretchable neoprene straps will fit most sizes. How to Choose the Perfect Knee Pads? Generally speaking, knee pads are protective gear designed to prevent knee injury and keep the knees healthy. Choosing the right knee pads will depend on your personal preferences and the purpose of the knee pad. If you’ll be using them for house activities and gardening, then something simple, comfortable and cheap will be perfect. However, if you’re doing heavy-duty construction work, where kneeling onto a pile of nails is a distinct possibility, then you would want high-quality knee pads with a hard plastic shell and straps that will make sure your knee pads stay in place during long work hours. If you plan to use your knee pads for sport or outdoor activities, then your choice will depend on the type of activity. If you use knee pads for activities such as basketball or volleyball, where mobility is of paramount importance, then soft, comfortable, sleeve type pads are the way to go. On the other hand, for extreme sports or activities such as paintball, where knee impact is likely or even expected, you would choose knee pads with a hard shell and plenty of cushioning to soften the blow to your knees. 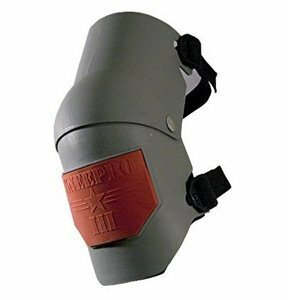 You should choose the material for the front part of the kneepad (the cap or shell in case of heavy duty knee pads) according to the level of protection you require. Knee pads are made from several materials, but the most common for work, sport or household purposes are fabric, plastic and rubber. Fabric – Fabric knee pads, such as the ASICS Unisex Slider V. or Troxell USA – Original Super Soft Kneepad, are usually flexible, lightweight and comfortable. They can be worn on bare legs and will not pinch or cause skin irritation. Fabric knee pads are an excellent choice for household activities such as cleaning the floors or gardening. They are also perfect for indoor sports since they are lightweight and will not impede your mobility. 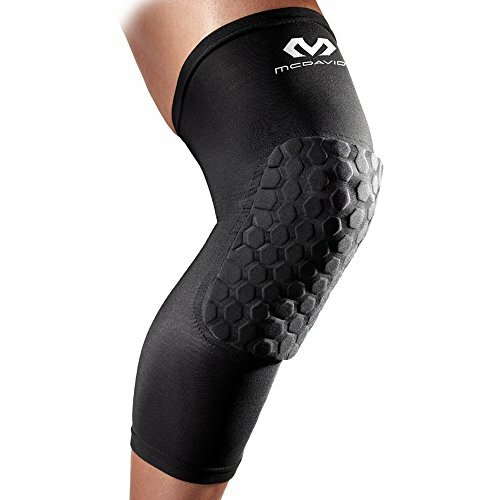 Additionally, when looking for sports knee pads, you should choose those with fabric that is designed to wick away moisture and keep your skin dry and cool, such as the McDavid 6446 knee pads. Fabric tends to rip when confronted with rough surfaces such as concrete or gravel. Also, the padding alone might not provide enough protection for your knees in case of forceful impact. If you need knee pads for heavy-duty protection, then plastic would be the material to go with. Plastic – Plastic kneepad caps, such as the DeWalt DG5204, or shells, such as the Knee Pro Ultra Flex III, will withstand pretty much any abuse you can put them through. They are sturdy and durable and are often not intended to be worn on bare legs, although this will depend on the kneepad. Plastic knee pads will provide ample protection from rough surfaces. They are ideal for construction environments where you need to spend long hours kneeling on surfaces that might be hazardous to your knees. An additional point you should consider when buying knee pads for work are non-slip features. Caps of work knee pads are usually flat at the center and textured to provide stability and traction. Although somewhat restrictive to your movement, hard shell kneecaps are a necessity for extreme sports or outdoor activities such as paintball. You should not make compromises with your health, so choose plastic pads if the situation requires. Rubber – Rubber knee pads, such as the Fiskars Ultra Light Knee Pads, are quite resilient, although not as tough and durable as plastic pads. The main advantage of rubber knee pads is that they are almost 100% waterproof, which makes rubber the material of choice for gardening knee pads. The choice of padding (cushioning), for your knee pads, is mostly a matter of personal preferences and needs. There are, however, certain advantages to different materials, and we will look at them briefly here. The most common types of padding are foam padding and gel padding. Foam Padding – Polyurethane foam padding is firm and can absorb impact very efficiently. It is the most often used type of padding in knee pads, as it will provide comfort for your knees while keeping them safe. However, since foam is firm, it will restrict your movement somewhat. Gel Padding – Usually used in combination with foam padding, the gel will shift to conform to your knee, providing exceptional comfort while not restricting your movement. The safest and most comfortable knee pads have a gel cushion on top of one or more layers of foam, such as the No Cry Professional Knee Pads. This provides maximum comfort and safety for your knees. If you’re using knee pads for sports or occasional housework, foam padding will provide plenty of protection and comfort. But if you have to spend hours on end working on your knees, or if you have knee problems in general, gel cushioned knee pads would definitely be for you. Knee pads are usually designed to open at the back, like protective knee pads, or sleeves, like volleyball knee pads. A third option is kneeling pads. We will briefly examine the different types of kneepad design. Open Knee Pads – Open knee pads do not cover the back of the knee, and are held in place by straps. They most often have one or two straps which are either elastic, adjustable, both or a combination (one strap being firm and adjustable and the other elastic and adjustable). The straps usually have either Velcro or click closures at their end. A point to consider regarding the straps is whether to go with Velcro or click closures. While Velcro straps are slightly more practical and don’t tend to get caught on stuff, Velcro can lose its grip over time and doesn’t hold the pads as firmly in place as the click closures. Another point would be the placement of the straps. If the straps are too close to the crease of the knee they can wind up in it, cutting off your circulation. As for the elastic vs. firm straps, this is a point of personal preference, although the elastic straps do tend to be a bit too stretchy sometimes, causing the knee pads to slip down your leg. Therefore, if possible, you should go with elastic Velcro straps for lightweight housework knee pads, and firm, click closure straps for the heavy-duty protection pads. Sleeve-Type Knee Pads – Sleeve type knee pads are usually tight fit and wrap around your entire knee. They are usually designed to be worn on bare skin since they’re often too tight to pull over normal pants. Sleeve type knee pads are lightweight and flexible, so they will not impede your movement. Apart from impact protection, some sleeve type knee pads, such as the McDavid 6446, offer the additional benefit of compression support. These knee pads will prevent the risk of knee damage by supporting and stabilizing your knees, which increases blood flow and reduces any swelling and pain. They are useful for sports such as basketball or weightlifting, where the great load is put on the knee joints. Although primarily designed for sports, sleeve type knee pads are an excellent choice for work environments where it is necessary to move around a lot and kneel once in a while. Kneeling Pads – Kneeling pads, such as the Custom Leathercraft Kneeling Pad, are basically cut out sections of thick rubber foam. They are more practical than knee pads in situations where you need to spend a prolonged amount of time kneeling in one place and occasionally move about. An added benefit is that you can sit on them if needed. Finally, you should choose the right size of your new knee pads. Many knee pads come in one size that should fit all users. That is ok for open type knee pads since they normally have adjustable straps. However, sleeve type knee pads of the wrong size can either be restrictive or constantly slide down your leg. Therefore, when ordering knee pads measure carefully and consult the size chart. Be mindful of product specifications, since different size charts require you to measure at different places. Particularly specific is the McDavid size chart, which requires you to measure the widest part of your knee while the leg is bent at approximately 45 degrees! Whether you’re a professional athlete, a construction worker or a paintball enthusiast, protecting your knees should be one of your main concerns. As we said before, since your knees are involved in almost any movement you make, even the smallest knee problems will cause you great discomfort and reduce your quality of life. Knee pads are a guaranteed way to keep some of the most important joints in your body safe, and you should not compromise your health for the sake of work or sports. There are plenty of different knee pads to choose from, and with the help of our guide, you shouldn’t have any problems to find a perfect pair that perfectly suits your needs and fits your knees.